VNRE – The freezing market has sent down real estate prices in Vietnam but investors do not feel the right time to invest in. According to Mr Stephen Wyatt, General Director of Knight Frank Vietnam, a property consulting company, investors never buy a product when the market is on the peak of a cycle. So, will real estate prices continue to fall more? It is obvious that development potentials of the Vietnamese real estate market remain huge. Oddly enough, although the demand is very high, dozens of thousands of apartments are unsellable. This is because owners do not want to sell on expectation of higher prices while buyers want to wait for lower prices. Indeed, this is possibly the best opportunity for long-waiting foreign investors to invest in. Currently, many foreign investors are ready to take over property projects invested by Vietnamese companies. At present, pressures are placed on the shoulder of domestic investors as they have to seek capital to ease financial strains. Although prices have fallen to the lowest level in the past two years, it is hard to find a meeting point of buyers and sellers. The supply of well-located and affordable projects is thin, and vice versa. Under this circumstance, both domestic and foreign investors prefer standing on the sideline and waiting for better policies. And, patience is seemingly rewarding when the State Bank of Vietnam (SBV) announced to cut ceiling deposit rates by 100 percentage points, laying the ground for the cut in lending rates. This is also the basis for many property experts to believe that the real estate market will recover towards the end of this year. Remarking on the medium and long-term real estate market, Mr Stephen Wyatt said opportunities for investors are optimistically open. “We are seeing strong demand for many of the investments, land and developments sites that we are currently selling. With renewed optimism and a return of confidence, 2012 is the time to start looking at investing in Vietnam”. The Vietnamese real estate market essentially enhances transparency and market laws to mitigate risks for domestic investors. The lack of transparency will lead to hearsay-based investment decisions. Real estate companies, particularly small and medium ones, lack administrative systems, especially risk management. The lack of operating professionalism is a reason why they difficultly access capital sources and do not have the trust of customers. Thus, according to experts, real estate companies necessarily restructure to have healthy market development. Mr Nguyen Huu Cuong, Chairman of Hanoi Real Estate Club, said: The property market will soon recover if the stock market gains stable growth and investor confidence as it is now. He said the stock market and the property market always have close interactive relations. Positive development of the stock market will be clearly translated into the revitalisation of the real estate market. Thus, if the current growth of the stock market is maintained and continued, capital flows from this market will surely run into the property market. However, it is extremely hard to identify what factors will determine the recovery of the real estate market. Real estate investing is typically driven by herd sentiment in Vietnam. Investors will jump into the market if they feel it is good enough but they will rush to exit if they lack confident. Hence, according to experts, the instability of the market is not over. VNRE – It is genrally agreed that with every challenge comes an opportunity, and the common saying is being used to talk about the local property market that has slid into difficulties since 2008. Many developers, especially those who rely heavily on big loans from banks, keep lamenting their current situation because they cannot clear their stocks as buyers are holding a wait-and-see attitude toward the market. Under pressure of paying debts, many of them fear that once the gloomy market is not improved, they will sooner or later go bankrupt. However, for many investors this is a good chance for them to come into the challenging market in a hope that they will stay ahead when the market is recovered from the downturn. High interest rate, credit restriction and inflation are problems real estate players, including foreign investors, are facing but those troubles are step-by-step being solved by the Government. “Current difficulty in Vietnam is short term because inflation problem is one of things the Government has decided to tackle,” Colin Dyer, president and chief executive officer of Jones Lang LaSalle, shared his view to the Daily on the occasion of his first trip to Vietnam. Observing the country from outside, Dyer said the Government was doing necessary measures to reduce inflation, and thus those problems would be short-lived. Overall, Vietnam and the rest of Asia are on a growth path thanks to having rising population and urbanization which can keep fueling commercial property market. David Lyons, Vietnam Country Head of Jones Lang LaSalle Vietnam, echoed his president’s view, saying that the property services provider’s global network is recording a positive sentiment from investors, especially foreign ones who are coming into the market to sound out opportunities. “We are seeing the property cycle in Vietnam now at or near the bottom…foreign investors say it is time to start to come in, and we see that trend,” Lyons told the Daily. Both experts reiterated the current difficult situation in the market, saying high interest rate has prompted very hard access to credits from banks. Across the board, it is not only development companies and investment companies but also individuals to see funds dried out for property investment. As a result, the housing price has dropped, and office rent is on downward trend because of abundant supply. Given the difficulties, the local property market has witnessed many cash-strapped developers have to sell their projects to others. The merger and acquisition activity is expected to continue increasing, which means that more and more property projects are to change hands this year. Daibiru Corporation, a commercial property owner and manager, entered into an agreement in late 2011 to acquire a company that owns the 18,000-square-meter grade A office building Saigon Tower on Le Duan Boulevard in downtown HCMC. The deal is expected to be completed in January 2012. Jones Lang LaSalle is reaching out its global network to search for potential investors for several projects that it acts as a broker. For example, the office building Centre Point on Nguyen Van Troi Street is being put up for sales after a local owner sold it to a Japanese fund, and now the fund has Jones Lang LaSalle to search for potential investors. In another project, the property services provider is looking for suitable investors for a multipurpose project named Royal Tower in the urban town Phu My Hung in HCMC’s District 7. The 21-story building offers some 41,000 square meters for office and retail spaces and is expected for completion in June this year. Besides, the company also acts as a broker for a commercial project named Lam Son Square in the resort city of Vung Tau. Lyons said the company is dealing with several international groups for those projects transactions. Most foreign investors come from within the Asian region, including Japan, Korea and Singapore because those investors know and can understand the dynamic market. Besides, the company is getting inquiries from American investors. Those potential investors are not only interested in office building sector but also industrial and logistic ones. Lyons said there are developers looking to sell their projects to international investors. When there are more and more international investors looking into Vietnam, ‘that is the sign the market become more mature’. Looking to the market trend, he projected that difficulties may be solved next year, and the local property market is hoped to go up again from the third quarter of this year. Dyer seconded his colleague’s ideas, saying that the market downturn was painful for short-term real estate companies and for the whole market, but it helps companies to restructure business and capital to go through the difficult time. Like other cities in the world, as the office rent in HCMC’s central business districts dropped by half, it is the chance for companies to move in, to take some advantages to get good deals, Dyer commented on the office market in Vietnam. 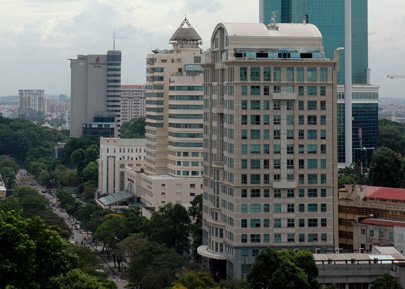 Office rent in HCMC is on downward trend for 12 consecutive quarters with asking rent staying around US$32 – US$43 per square meter for Grade A building, some US$14 – US$32 for Grade B and some US$10 – US$25 for Grade C facilities. According to the research team of Jones Lang LaSalle, the current difficult market conditions force some landlords, besides offering rental discounts or other incentives for long-term leasing contracts, to sell all or part of their buildings. This is an option for the developers to recover their capital quickly. Total net absorption during 2011 reached over 168,000 square meters, a decrease of 9.4% year-on-year. In the last quarter of 2011, net absorption slumped across all grades, especially in Grade C and in suburban areas. This was probably due to office buildings in higher grades that offer attractive facilities, convenient locations, and increasingly competitive rents. At the end of 2011, the market saw no new supply, thus the total stock of all grades in HCMC remained stable at over 1.3 million square meters. With more than 40 projects currently under construction with over 558,000 square meters, the total stock in HCMC is expected to be double by the end of 2015. Jones Lang LaSalle projected that this new level of supply will increase the vacancy rate in the HCMC office market, and thus rents could remain on a downtrend in 2012. VNRE – Tightened credit policy that favours a high restriction on loans for tightening non-productive areas to curb inflation has caused the Vietnamese real estate market to fall short of capital. Therefore, a lot of investors have resorted to stimulus measures to raise funds to restart their projects. According to a survey by Colliers Vietnam, the investor of Thang Long No1 project located on Thang Long Highway, is offering at VND35 million per square metre. The project, which consists of two office towers and three upmarket apartment blocks, has a total area of 40,000 square metres. This will be a prominent landmark in the overall architecture and landscape planning of the space surrounding the National Convention Centre. In addition, to stimulate demand, many investors continue with their hefty promotion programmes. Daewoo Cleve located on Le Trong Tan Street, Ha Dong District, is offering at VND25 million per square metre. The investor of this project has collaborated with banks to provide soft loans bearing annual interest rate of 12 percent and buyers can borrow up to 25 percent of apartment value. Buyers pay interest on a monthly basis while principal payments are delayed to the end of the first quarter of 2014, when the house is transferred to buyers. This is a high-class international standard apartment close to major trade centres, financial centres, hospitals, international schools and local administrative bodies. Once completed, the project will provide the market with more than 4,506 apartment units. Sky Garden located in Dinh Cong ward is also offering incentives to buyers in the first round of capital contribution. For quick capital recovery, the seller agrees to discount 10 percent if buyers settle 80 percent of the house value. The investor of Tan Tay Do Apartment project also offers a discount of 2 percent to its customers, while Green Park project presents interior furniture voucher worth VND50 million. However, these demand-driven stimuli still turn out to be not attractive enough to customers. According to experts, the Vietnamese property market is typical of supply and demand contradictions (supply rises but demand falls and vice versa). However, this seems not to be the case in 2012, because the wide gap between demand and supply has inflated the price of property assets like a balloon. In case of oxygen insufficiency, the balloon begins to deflate and possibly bursts. Previously, many experts had warned against oversupply. Actually, at present, many projects have come to a halt due to capital shortage. According to market surveys, sharp drops are seen in high-grade segments. Prices have slid by VND10 – 12 million per square metre. A few house deals with prices ranging from VND35 million to VND40 million have been reached recently. However, there is a little decline in downtown house prices. It is obvious that investors must create product lines different from the rest of the market. First, they must launch more competitive prices. Second, they need to build houses with small areas which are affordable to more people. VNRE – While global economic recovery is lethargic due to financial difficulties of leading economies, Vietnam issued new land management, fiscal and monetary policies in a bid to bolster macroeconomic stability. With respect to real estate field, the introduction of Decree 71/2010/ND-CP of the Government has created positive effects upon property investment and business. However, in practice, this policy also limits cash flows into real estate because of relatively stringent and rigid rules on fundraising. To learn more about this, Journalist Do Son of Vietnam Business Forum Magazine has an interview with Mr Nguyen The Diep, Vice President of the Vietnam – Germany Small and Medium Business Association, and President of Reenco Song Hong Investment Joint Stock Company. What is your assessment of the positive effects of Decree 71 dated August 8, 2010 on real estate investment and business? Firstly, investors can mobilise capital by issuing corporate bonds, nonbanking institutions (investment funds, financial companies, etc.) and certainly loans from commercial banks. Secondly, primary investors can transfer a part of their projects attached with infrastructure to secondary investors when their projects have completed site clearance. Thirdly, property project investors can mobilise capital from individuals and organisations to build houses on profit-sharing or production-sharing principles on the basis of negotiation and sharing. But, this approach is not allowed to exceed 20 percent of total products of individual projects. Previously, according to Decree 90, investors entered into capital sharing or lending contracts before fixing products and executing. So, Decree 71 will have positive impacts on the real estate market in some of the following aspects. Firstly, investors can develop capital sources and increase capital healthily and transparently. Secondly, the Decree specifies the time for evaluation and approval of projects. Housing projects with less than 500 apartment houses will be decided by district authorities and the time for this process is no more than 30 days. Hence, the supply of the property market will increase, helping balance supply and demand, ease local fevers and reduce risks for end customers. The process of making financial capital sources healthy is also a good element for the market, as fundraising must be carried out in a clear framework, not free as earlier. As a result, property investors will have better ‘health’ in the future. But, it is said that this policy inhibits capital from flowing into the real estate market. What is your opinion about this? That’s correct. Relatively restrictive regulations on capital mobilisation provided by Decree 71 and Circular 16 affect the rights to mobilise and attract investment capital. Specifically, these regulations provide lending from credit institutions and investment funds while not mentioning loans from other institutions and individuals. Investors are also not allowed to issue bonds attached with the preference rights to purchase apartment houses. These reduce the appeal of projects in the eyes of business partners. Worse, the time of raising funds for projects according to profit-sharing principle or production-sharing principles prevents investors from forming business cooperation with other partners in accordance with the Law on Investment. In addition, the unclear definition of “mobilising a maximum of 20 percent” leads to different interpretations. Decree 71 and Circular 16 do not define what capital mobilisation means, but only apply the method of itemising contracts to define capital mobilisation. Using the itemisation method is not enough, because it drops many types of contracts as provided in Civil Code 2005, like the deposit contract which provides the guaranty of future contract signing and enforcement. The business cooperation contract signing clause stipulates that in case of not having certificate of ownership rights and not receiving houses, business cooperation parties are not allowed to sign contracts with the buying and leasing parties, but transfer such contracts to investors to sign. This provision will raise difficulty for all concerned parties, reduce the autonomy of business cooperation parties, increase the responsibility of investors, and in fact cause disputes in case investors swindle. According to Article 63 of Decree 71, authorisation contracts are not permitted for public notarisation for the purpose of restraining multiple transfers of houses. Nevertheless, such a regulation is not really fair to both investors and buyers because the trading of property products brings profits for investors. Therefore, this is also regarded as an important legitimate channel of capital mobilisation. Notably, while a series of barriers in the Housing Law and the decrees guiding the implementation of Law on Real Estate Business are not eased, the ongoing credit squeeze will send the market to the hands of foreign companies. Decree 71 plus the tight credit policy provided in Circular 13/2010/TT-NHNN, which specifies that the risk ratio of credit to property investments is lifted to 250 percent from 150 percent and the ratio of credits for nonmanufacturing sectors like securities and real estate is reduced, has caused serious impacts on the real estate market and the economy as a whole. It is believed that this is a war of life and death, but it will make the market better. I think this is right but insufficient, because the current situation is the upshot of many previous regulations and policies. Do you have any recommendations to rescue the property market? I think the most important thing is to improve macro management mechanisms and policies, and to ensure the maximal exploitation and mobilisation of domestic and foreign financial resources for housing development, property market development, and sustainable economic development. Up to 70 percent of Vietnamese real estate businesses are small and medium-sized. Thus, many may collapse as a result of Decree 71 and tightened credit policy. State agencies should issue policies to balance and sustain development.